In 2012, political commentator, author, disgraced former university president and convicted felon Dinesh D'Souza released "2016: Obama's America," a documentary that purported to investigate our president's past in order to uncover his hidden agenda that, left unchecked, could very well lead our country to the brink of destruction. Although the film was mocked by many of those who bothered to review it (it did not receive advance critics screenings, meaning that there were few reviews when it opened and that supporters could then claim that it was being ignored by the lamestream media) and most of D'Souza's findings and conclusions were widely discredited by scholars, journalists and others with a weird reliance on things like facts, the film became a hit amongst conservative audiences and would pull in $33 million dollars at the box office, making it number 2 on the list of top-grossing political documentaries, just missing out on beating "Fahrenheit 9/11" by only $86 million. D'Souza has returned with "America," a movie that arrives on the heels of an ad campaign that suggests that it will be a bit of speculative fiction examining what the world might be like if George Washington had been felled by a British bullet during the Battle of Brandywine (on September 11, 1777, for those of you playing at home) and, as a result, the Revolutionary War had been lost and the United States of America had never existed. However, anyone turning up at the multiplex in order to see what promises at first to be a blend of "It's a Wonderful Life," the immortal anti-Communist short "Red Nightmare" and an evening of the History Channel will be outraged to discover that, following a brief prologue, the film completely abandons that promised conceit and never returns to it. If it is any comfort to those viewers, it is that they will soon be sharing their outrage with anyone who turned up in the hope of witnessing cohesive thinking or rudimentary filmmaking skills. Having seen all of his dire predictions about the direction of our country under Obama's lead in "2016: Obama's America" come true—his perspective, not history's—D'Souza finds himself pondering the state of his adopted country and wondering why so many people want to destroy it by undoing everything that made it great in order to remake it into some kind of socialist nightmare. Furthermore, he wants to get to the bottom of the notions that monsters like Noam Chomsky, Howard Zinn, Michael Moore and other members of the radical cabal use as a basis for their alleged hatred of America—that we stole the land from the Indians and committed genocide against them to boot, that we seized a huge chunk of Mexico as well, that we are trying to dominate the world and as much of its resources as possible, that there is a staggering amount of income inequality that unfairly leaves the vast majority of our wealth in the hands of a few people and, of course, slavery. In an unexpected twist, D'Souza amazingly manages to refute all of those claims to the satisfaction of his target audience. Most of his theories and suppositions are misleading at best (he makes a point of mentioning that Obama supported the bank bailouts but fails to mention whose presidency they occurred under) and silly at worst (such as his assertion that the real face of income inequality is none other than Matt Damon since he made a lot of money from those Jason Bourne films) and will presumably be picked apart in the coming weeks but in order to save time and energy all around, I will not criticize it on those grounds, except to wonder why he left the recounting of the Texas-Mexico conflict to Canadian-born Ted Cruz. My job is to analyze how the film works in cinematic terms and on that basis, D'Souza and co-director John Sullivan (who also directed the other big conservative-leaning documentary "Expelled: No Intelligence Allowed") have failed miserably. It looks terrible, it plods along with all the verve of a PowerPoint presentation, the occasional dramatic recreations are exceptionally cheesy and the interview footage is so needlessly over-edited that you get the feeling that something may have gotten changed around in the cutting room. Now I am not claiming that they have fudged some of the conversations, only that they have presented them in a way that makes them look as if they were fudged. Say what you will about Michael Moore—at least he makes his films look slick and professional even while occasionally bending the narrative as needed (which is one of the reasons that they stir up so much controversy) instead of like a junior college multi-media project that was returned with "See Me" written in the corner. For that matter, Moore is also an entertaining screen presence as well, which is more than can be said for D'Souza. He has precious little screen presence, his interview style veers between the fawning to the absurdly combative and he practically oozes untrustworthiness to such a degree that he winds up undercutting whatever arguments he might have legitimately made. 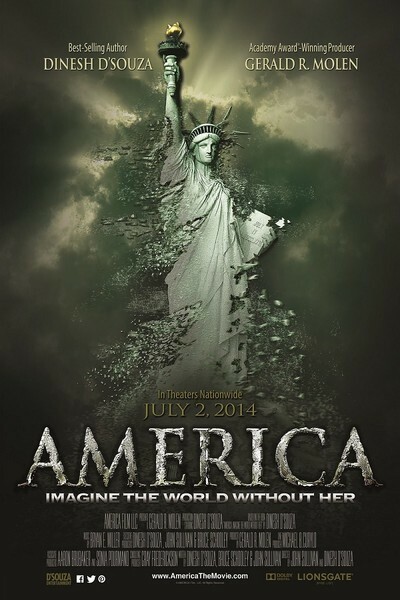 The only time that "America" comes alive is in the final section when, having undercut any reason for good, God-fearing people to hate America, the film sets out to identify the people who are trying to ruin everything in order to push their devious agenda. As it turns out, the architect behind all this is Saul Alinsky, who used the lessons in organization that he learned from famed gangster Frank Nitti to pull together hippies and community organizers together to push things forth. Although Obama is deemed Alinsky's most famous disciple, he is no longer running for office so obviously a new target must be found. In a stunning development, that target turns out to be none other than Hillary Clinton, who uses her power to steer Alinsky into new and dangerous directions. This means that we get to see amusingly staged dramatic recreations in which Hillary, "under the spell of a Methodist minister," meets in back rooms with Alinsky, who is made up to look like the creepy stranger offering kids candy and a ride in his van in an old Sid Davis social hygiene short, to get her marching orders. Thanks to their efforts, we now live in a land in which we learn that even an ordinary guy can somehow commit three felonies a day just by doing his own thing. Of course, this is the part where D'Souza finally mentions his own recent conviction after pleading guilty to campaign finance violations, leading to a shot of him sitting handcuffed in a cell—presumably to show the sacrifice that he has made for telling the truth in his last film—that will inspire murmurs of outrage from some and outright giggles from others. Yes, this section is inadvertently hilarious and overwrought but at least it’s presented with an energy that the film otherwise lacks. Other than that, "America" is like the cinematic equivalent of one of those forwarded e-mails of mostly discredited "facts" that you receive from an uncle and at least those sometimes include family photos or a meat loaf recipe that can be of some value.